These perfectly portion controlled Lemon Blueberry Cheesecake indulgences have ONLY 107 CALORIES per bar! 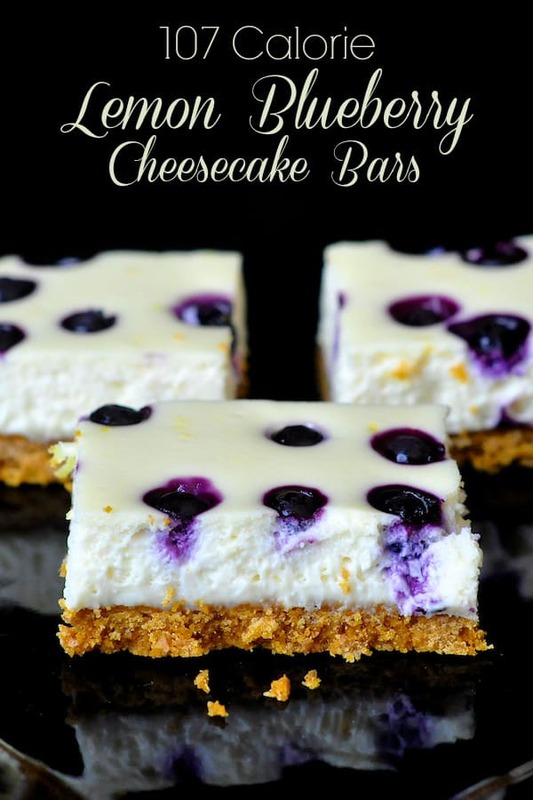 These are a quick way to make small servings of a delicious cheesecake which I especially like to have on hand in the freezer during the holiday season. I either pre-cut them into bars and freeze them in airtight containers with each one nestled inside a paper muffin tin liner to easily pluck out as many as you need to thaw at a time. I also freeze an entire batch, uncut, in case I need larger servings to serve as a decadent dessert for unexpected dinner guests. Either way you will always be prepared to serve something utterly delicious to family or guests. You may also like our recipe for Mini Raspberry Tuxedo Cheesecakes. 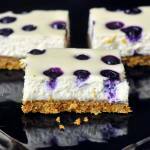 Like this Lemon Blueberry Cheesecake Dessert Bars recipe? Lightly grease a 9×9 inch baking pan and line it with parchment paper. Mix together the graham crumbs, melted butter and sugar and press into the bottom of the prepared pan. Beat together the cream cheese, sugar and vanilla extract until smooth. Blend in the whipping cream along with the lemon zest. Sprinkle the blueberries evenly over the cheesecake batter. Bake for 25-35 minutes at 300 degrees F until the center sets. To ensure even baking you can place the baking pan into a larger baking pan and fill half way up with boiling water. This may slow down the cooking process and require a little extra baking time but the cheesecake will bake more evenly from the edges to the center. Cool completely before cutting into bars and serving. Store in the refrigerator or freeze until needed. I either pre-cut them into bars and freeze them in airtight containers with each one nestled inside a paper muffin tin liner to easily pluck out as many as you need to thaw at a time. I also freeze an entire batch, uncut, in case I need larger servings to serve as a decadent dessert for unexpected dinner guests. How stiff should these be when they come out of the oven? I’ve been backing them with the water method but I’m not sure of te consistency I’m waiting to see. Do I bake the crumb base before adding the cheesecake topping? You can if you like but it’s not necessary in my experience. I usually serve these as a dessert with a spoon but if making them to be hand held as cookie bars, it’s probably a good idea to give the bottom 5-10 minutes in a 350 degree oven. These bars look just adorable! Love the purple color of blueberries on the top. The best thing is that you can freeze these. Great to have such an amazing treat in hand for holidays. Will try it soon! Made these last night and they were better than expected. Absolutely delicious. Will be making again. Do you whip the whipping cream?